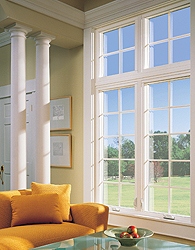 Installing casement windows is a versatile way to create a dynamic, beautiful look for your home in Washington, D.C., Arlington, VA, McLean, VA, and elsewhere in the region of Northern Virginia and Maryland. Shiner Roofing, Siding and Windows provides our customers true design advantages, such as a slim profile, larger sizes, and wider views. Your home also can benefit from maximum ventilation, thanks to the 90-degree opening, and an out-of-the-way space can be given access to more light and air. Casement windows are hinged on the side, typically opening inward but occasionally outward, depending on how they are installed. Casements usually come in sets and often are included in an arrangement using a combination of awning windows (hinged at the top) or in a vertical array of several outward-opening lights (panes) lined up along the length of a porch or a lanai. Another design possibility might be to add even more ventilation with a bay-bow window, or create an entire window wall to provide a dramatic view of the outdoors. Practically maintenance free – Vinyl frames never have to be scraped, painted, or stained; they continue to look like new through every season, year after year. Incredibly durable – Unlike wood windows, our vinyl windows will never expand or contract with changing temperatures, and they come with a lifetime non-prorated warranty. Extraordinarily easy to clean – Thanks to a handy tilt-in feature, you can have access to both sides of the glass from inside your home. Shiner Roofing, Siding and Windows is a licensed, bonded, and insured home improvement contractor in the states of Virginia and Maryland, as well as the District of Columbia. We are locally owned and operated, and we have proudly served our friends and neighbors in the D.C. region since 1981. In more than three decades since we were founded, we have completed more than 16,000 home improvement projects. Our customers routinely honor us by coming back to us when they need a new roof, new siding, or replacement windows. Contact us today to learn more about the many design options we offer using casement windows and more.